The Leander Cot is different from any other cot on the market. 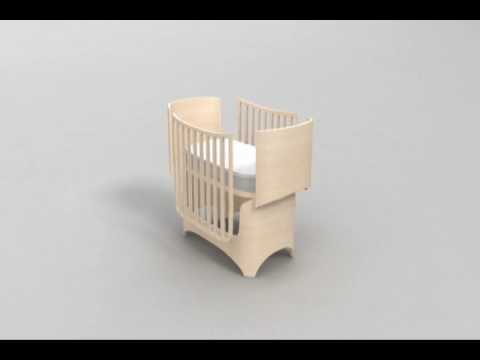 It has been designed with the child's perspective in mind, and the result is a stunning looking baby cot which can convert into a junior bed for the older child via stages. With its oval shape and quality materials the Leander Cot takes the tradition of Scandinavian craftsmanship and design to a new level of excellence. It is easy to assemble and use and is safe for your baby. 1. For infants, the cot base is positioned at the high setting as your baby is not yet mobile and does not need the high sides for protection. 2. Once your baby is mobile, the base must be lowered so the high sides can keep him/her safe. 3. As your baby becomes a toddler, the first adaptation takes place: one of the rail sides comes off. The familiar feeling of protection and safety provided by the high sides is maintained but this configuration allows your child to climb in and out by him-/herself. 4. As your child develops further, the other three sides are removed (all together) and the cot is now a small bed without any signs that it was ever a cot. 5. Your child's continued growth dictates when the transition to the junior bed takes place. The timber extension pieces required and the extension mattress piece are bought separately. You can also add a junior bed guard as seen in the image below. The Leander Cot is made from European beech, which is plantation grown and sustainable. All varnishes, glues and paints used are non-toxic and safe for your baby. The cot is approved to Australian Standards and undergoes regular testing to maintain its certification.